This is the second post reflecting on my involvement in an initiative developing online facilities for postgraduate research students in the School of Education at the University of Nottingham. The project has highlighted key sociocultural aspects of digitally mediated doctoral practice that have resonated with my PhD research, and here, I continue to explore the ‘taxonomy’ of binaries that emerged, describing some of the interrelated contexts that often underpin these types of initiatives. In challenging some of the common assumptions associated with the student-staff binary in the first post, a number of additional interrelated and equally messy student binaries also emerge, primarily associated with mode, location and stages of study. Doctoral student experiences of departmental support vary considerably through factors that are both sociocultural and related to individual agency. Practice profiles and study routines are heavily dependent on the many complex issues surrounding identity development, socialisation and a whole range of external factors. PhD students have shown to be highly strategic in how they negotiate different peer groups, and appropriate them for social and professional purposes (Baker & Pifer, 2011). Yet despite the access to external and increasingly networked (inter-) disciplinary communities, most doctoral peer networks and collaborations occur within cohorts defined by the structural and proximal attributes of formal programmes and institutions (Pilbeam & Denyer, 2009). University departments therefore strive to maintain the identity and social cohesion of formal cohorts whilst encouraging interaction and socialisation within the wider doctoral student community. The role of online provision in this is often primarily oriented towards the needs of distance students, partly in an attempt to somehow replicate the perceived social and cultural benefits of the campus-based experience. In particular, there is an overwhelming sense that distance students routinely miss out on the informal, everyday discussion and interaction associated with the campus environment. Clearly, such an environment is seen as enriching the general experience of studying. But we should not underestimate how important a role the regularity, informality and collegiality of everyday interaction plays in providing students with access to key information about contacts, resources and ‘academic hacks’ that can significantly influence student progression. Online environments such as social networks, forums and blogs can augment such activities. However, historical attempts at replicating the informal ‘in real life’ interaction and communication on online platforms have been mixed at best. Arguably, once any form of informal interaction becomes structured or decontextualised, there is a risk of loosing both the authenticity and informal spontaneity that sustain such processes. Of course, we always run the risk of homogenising distance students, often – in the case of international students in particular – at the expense of recognising cultural diversity and local needs (Deem & Brehony, 2000; Goode, 2007). In reality, distance students will experience varying degrees of isolation, partly depending on location, digital access and ability to travel. Conversely, ‘campus-based’ students often choose not to fully utilise campus facilities for any number of professional and personal reasons. Often, the distinctions we make between formal full-time and part-time modes of study are similarly over-emphasised. In the lifespan of a doctoral programme, many full-time students will operate at part-time levels of study for significant periods of time, by necessity and by choice – often not fully disclosing ‘extra-curricula’ activities to supervisors or administrators for fear of compromising programme or funding requirements. The study trajectories of doctoral students – at least within the Humanities and Social Sciences – are often characterised by a fragmentation of early-stage cohorts, as individuals disperse to do data collecting or engage in intensive solitary periods of analysis and writing up. For distance students – who may have had the opportunity to establish a short-term cohort through an initial campus-based foundational period of study – this might be even more pronounced. Students typically arrange to meet up with each other periodically, either on campus or elsewhere (distance students may be usefully located within ‘regional’ clusters), and generally, departmental activities and communications continue to serve as conduits, keeping them informed of research projects, events and training opportunities. But how can departments best utilise online provision to facilitate more systematic methods of continued peer support that maintains the identity and social cohesion of cohorts and provides students with the means to continue interacting with familiar and trusted colleagues? The chance to engage across doctoral groups and cohorts is also valued, helping students establish useful connections and initiating opportunities for informal mentorship. Any opportunities for early- to mid-stage students to tap into the personal insights and experiences of late-stage students or recent graduates may be particularly valuable, as they share advice on finishing theses, negotiating vivas and career progression. On campus, internal events such as student seminars and conferences typically provide opportunities for interaction across cohorts, whilst special interest research / reading groups can cultivate sustainable networks within the student body, within and potentially across departments. Everyday campus-based interaction can provide the opportunity for less formal and loosely structured forms of mentorship to occur between students at different stages of their doctorate, though this is very dependent on the physical environment, and the configuration of both study and recreational areas (departments often purposely implement inter-cohort environments). Online provision can augment many of these activities; facilitating network and community development through shared research interests, maintaining communication between events or group meetings, and supporting other inter-cohort interactions that are also inclusive of distance students. In the next post, I’ll be looking at the internal-external binary. Baker, V. L., & Pifer, M. J. (2011). The role of relationships in the transition from doctoral student to independent scholar. Studies in Continuing Education. 33(1), 5-17. Deem, R. & Brehony, K. J. (2000). Doctoral students’ access to research cultures – are some more unequal than others? Studies in Higher Education, 25(2), 149-165. Goode, J. (2007). Empowering or disempowering the international Ph.D. student? Constructions of the dependent and independent learner. British Journal of Sociology of Education, 28(5), 589-603. Pilbeam, C. & Denyer, D. (2009). Lone scholar or community member? The role of student networks in doctoral education in a UK management school. Studies in Higher Education, 34(3), 301-318. Over the last few months, I’ve been working on the initial stages of an initiative to develop online facilities for postgraduate research students in the School of Education at the University of Nottingham. After reviewing existing provision within the School, meeting staff and interviewing students, we are currently in the process of implementing a number of design ideas. Whilst this is not a research project as such, it has been interesting to note how it has highlighted key sociocultural aspects of digitally mediated doctoral practice, which have resonated with my PhD research. Among other things, the work has thrown up some prominent yet problematic binaries. These are nothing new, but it is useful to challenge some of the common assumptions associated with them. Collectively, these binaries represent a taxonomy of sorts, describing the interrelated contexts that often underpin these types of initiatives. I’m kicking off here with a look at the student-staff binary. At departmental level, academic staff contribute to the doctoral student community through supervision, teaching and, to a lesser extent, dissemination of their own research. However, given the heterogeneity of the staff body, the interrelationship between individual job descriptions, formal affiliations within and across faculties, and doctoral training roles and policy agendas is seemingly a complex one. We should also acknowledge the important role that research administrators and support staff play in updating students on events and funding opportunities etc., whilst contributing to the maintenance of protocols and documentation related to programme requirements. Individual academics will draw on diverse experiences, perceptions and incentives when engaging in new online environments. This may however, provide an opportunity to develop more visible profiles within the department generally, and be seen as being more ‘accessible’ to the student community. Collectively, staff participation in online provision can provide doctoral students with additional perspectives, expertise and knowledge. But whilst this may help address inconsistencies in supervisor provision, is this disruptive or complimentary to the student-supervisor relationship? To what degree might the increased diversity of (potentially conflicting) ideas and perspectives compromise or even undermine the specific and informed authority, trust, guidance and integrity of supervisors? This draws into focus the tension between the interpersonal context of the student-supervisor contract, and the environmental context of student socialisation. It’s a complex relationship, and as Green (2005) suggests, supervision is often ‘representational’ in nature (of both the department and the academic discipline). Whilst Batchelor and Di Napoli (2005) argue the student-supervisor relationship should be “devoid of too many unwanted interferences from the other people and structures,” it is becoming increasingly compromised by supervisor workloads and the rise of generic, centralised training agendas. So whilst the supervisor relationship constitutes a huge intellectual investment, student agency and self-efficacy are partly defined by the ability to tap into the academic capital of the department as a whole. Within the online context, this invariably depends on the nature and depth of the staff interaction or contribution, and the type of knowledge generated. Often, this will be limited to providing additional taught materials or supplementing other ‘on campus’ activities (such as online resources related to a seminar). However, more invested or responsive activities – such as participating in online discussions, blogging or sharing extra-curricula resources – may constitute a significant shift towards cultivating a more immediate and collegial relationship between the student and staff communities. Again, it is interesting to consider this within the socialisation frame, as the student is expected to become increasingly participative and integrated in the academic activities of the department. That said, it may be the students themselves who are most keen to maintain clear distinctions between the two groups, as they will often privilege staff contributions above those from their peers. Secondly, dedicated ‘student-only’ spaces for dissemination, discussion and resource sharing may prove a more effective environment to encourage student engagement and confidence building, and cultivate sharing and experimentation. Early stage students in particular may be reluctant to raise concerns or reveal knowledge deficits in a more integrated staff-student environment. Further binaries also exist within the student community itself, and I’ll be looking at these in the next post. Batchelor, D., & Di Napoli, R. (2005). The doctoral journey: perspectives. Educate, 6(1), 13-24. Green, B. (2005). Unfinished business: subjectivity and supervision. Higher Education Research and Development, 24(2), 151–63. I came late to today’s Twitter discussion initiated by @Nadine_Muller on feedback following academic interviews. In most sectors, providing feedback remains a relatively rare practice. After all, once a candidate is unsuccessful at the interview stage, their potential value to that institution or company is invalidated. However, I was struck by the sentiments expressed in @MerrickBurrow’s response that academia might have a collective responsibility in this process. @LisaWeihman @Nadine_Muller @GaryManders That's one reason why I like academia. There's an ethical obligation to the development of others. As someone who is once again embarking on the interview circuit, there is no question that feedback can be useful, though in my experience, it is often supportive but limited in its criticality; responsibly cloaked in standardised jargon that is not particularly constructive. To an extent, the authenticity of feedback is always going to be moderated by what can be appropriately disclosed. Having had limited experience of sitting on interview panels, both in and out of academia (which I have to say is the best possible training for ‘being’ interviewed), I realise the selection process can be significantly influenced by personality traits and an instinct for who might best ‘fit’ within the culture of the working environment (particularly if candidates are closely matched professionally). It is hardly appropriate that such subjective views be included in any subsequent feedback. But as the Twitter discussion revealed, some academics do genuinely go out of their way to try and give honest feedback – either as standard procedure or on request – though as several people suggested, assessment of specific candidates can vary widely within interview panels, and a consensus view may be difficult to articulate. Whilst a personal commitment to responding to a feedback request is hugely appreciated, I suspect many large institutional interview procedures (such as at a University) are increasingly subject to Human Resources protocols. If so, I wonder if these could be exploited to enable a more systematic approach to feedback provision? After all, many job applications routinely indicate where the interview constitutes specific assessment criteria, yet such distinctions are rarely alluded to in any feedback. In particular, feedback that enables the unsuccessful candidate to make a clear judgment between that which may relate to their (relative) unsuitability for the position (which may have emerged in the interview discussion), and that which relates to their actual performance in the interview (communication skills, self-confidence, critical thinking and problem solving etc.) would be highly valued. Platforms may incorporate default content added by the developer (think of a ‘sample post’ on a new blog), but creating bespoke sample content allows it to be relevant to the specific context of the site. However, it might sometimes be considered advantageous to fall back on ‘decontextualised’ content, to reduce risks associated with establishing cultural norms. A single sample of content may be sufficient to demonstrate the functional role of any given component but fundamentally constrains the cultural diversity that multiple samples will enable. However, multiple samples that are similar or repetitive can serve to emphasise cultural norms by their uniformity. The identity and the number of contributors is a related factor here. Sample content is often added to a new site by a single contributor, whereas multiple contributors will promote diversity. But how representative will they (choose to) be of the intended user group? This raises issues of authenticity. It is possible for a single contributor to fabricate multiple users and aliases. If the site is intending to facilitate activities or resources that are replacing or updating current practice, sample content may be transferrable from existing sources. As exemplars, sample content may be temporary; to be deleted at a further date in time once subsequent (and more contextually pertinent) content has been added. The design and customisability of the platform will to an extent determine opportunities for creating sample content. Some platforms may have well-established norms of use that one may want to either reinforce or challenge. In addition, one has to be aware of the potential influence of participants’ familiarity with a specific platform – or with a similar site in another context – in engendering habitual practice. There is a danger of launching and promoting a new site with minimal content and then sitting back and expecting things to happen. A more sustained timescale, in which sample content is added continually, might better create the appearance of an active, dynamic site. Sample content is typically utilised in the components, processes and scenarios explored during prototyping or initial design stages, and helps facilitate decisions related to functionality, navigation and layout etc. Therefore the above factors are determined, to an extent, by the design process or framework one chooses to adopt. In particular, a participatory design model may involve participants in the selection and/or production of sample content. Indeed, beyond initial prototyping and the ‘launch’ of a new site, they may continue – either informally as ‘early adopters,’ or through formal ‘mentorship or stewardship’ roles – to be the principal content managers, maintaining the momentum of the site’s activity, and influencing cultural norms to the extent that they establish best practices. We can see the foundations being laid for a public conversation that unites universities’ academic discourse with a new appreciation of certain forms of political conduct, in ways that could ultimately prove genuinely productive. There are clearly implications here for the nature of dialogue and collaboration between academics and external partners. But Thrift’s notion of compromise offers an interesting perspective with which we might equally view different aspects of interdisciplinary practice. Terms such as interdisciplinarity, multidisciplinarity and transdisciplinarity are often used interchangeably, though these are distinct definitions (see for example, Dyer, 2003, Stock & Burton, 2011). In representing increasing levels of integration, each of these essentially describe what disciplinary values, beliefs and practices are contested, i.e. how much are participating academics willing to compromise. If, as Thrift suggests, compromise constitutes “a set of productive alliances that are only ever loosely brought together through various acts of diplomacy,” two things occur to me. Firstly, how the apparent ‘distance’ between participating disciplines is conceptualised. There is, for example, an increasingly rich heritage of collaboration between the Arts and the Sciences, though from my own limited experience, projects often explore largely abstract ideas at a thematic or conceptual level. Contrast that with, say, activities associated with the learning sciences, in which participating disciplines (typically education, psychology and the computer sciences) tend to engage in purposeful, problem-based practice, potentially exposing raw disciplinary differences. Secondly, Thrift references Robert E. Goodin’s book, On Settling, which posits a ‘making do’ attitude; accepting when something is ‘good enough’. It may be easier to ‘make do’ with compromising disciplinary values in relatively short term, project-based activities than it is when committing to establishing sustainable long-term collaborative practice and generating new knowledge. Dyer, J. A. (2003). Multidisciplinary, interdisciplinary, and transdisciplinary: educational models and nursing education. Nursing Education Perspectives, 24(4), 186-188. Stock, P., & Burton, R. J. F. (2011). Defining terms for integrated (multi-inter-trans-disciplinary) sustainability research. Sustainability, 3, 1090-1113. Academics who actively engage in social media often get asked how they manage to find the time. I hear this quite a lot in my workshops. Such concerns are understandable, yet are often raised under a misconception that participating in these activities necessarily constitutes additional workload. I tend to argue that over time some of the academic practices you can develop through using social media can replace, supplement or enhance existing tasks. But how do we go about developing concrete examples, and what’s the best way of communicating them? 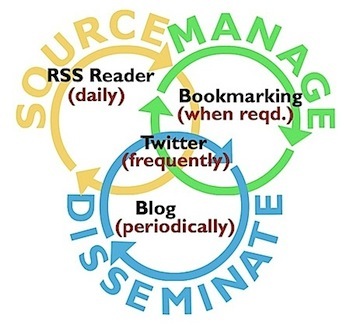 In a recent workshop, I explained how participating in academic-oriented networks (such as through Twitter or Facebook) and following multiple blogs (most efficiently aggregated through an RSS reader) can significantly contribute to resourcing new publications in one’s research field. Examples such as these relate emergent social media practice to existing problems that academics encounter in their everyday work, in context with the methods they may already employ to resolve them (in this case, using established database search and alert systems). Generally, academics will only consider integrating social media in these types of activities if they are seen to be either a) adding more value or quality (however these are perceived), or b) providing more efficient (i.e. time-saving) methods. In reality, such transition is rarely straightforward, and its effectiveness may not be immediately realised. It may be partial i.e. new activities may augment rather than replace existing methods. (In the example above, it may be necessary – and indeed well-advised – to continue using database systems, albeit at a reduced level.) Further, social media are multipurpose, in quite complex and ambiguous ways. The initial motivation for adopting specific platforms may constitute one of many potential benefits and risks. Therefore, any shifts towards social media-facilitated activities will tend to be multiple and interrelated, within various loosely-connected timeframes. This highlights the limitations of instrumental perspectives inherent in learning and adopting new technologies, and the problems associated with attributing affordances to social media. This is often accentuated in training environments, which tend to be incentivised towards rather abstract and non-contextualised learning outcomes. Therefore, we might need to emphasise a more ecological perspective, which positions the role of social media within the emergent socio-cultural shifts taking place in academic practice. Thinking about the example above, increased engagement with social media represents a shift from purposeful to speculative or opportunistic ways of sourcing knowledge, which are reliant on (and only realised through) developing online networks and communities, which invariably involves a period of maturation. With this in mind, training programmes can incorporate more inclusive forms of shared practice and opportunities for ongoing mentorship and peer support (some of which might be appropriated through social media themselves). I explored these ideas further here (towards the end). Crucially, in relation to communicating how activities might be facilitated by social media, we should not necessarily focus on convenient ‘before’ and ‘after’ comparisons, but acknowledge and incorporate the messy (and sometimes unsuccessful) periods of transition, recognising also that these are multiple, interrelated and ongoing as new social media and related practices are considered. Just a quick Bank Holiday shout out to a new website archiving Scottish football fanzines. The author contacted me about using text from my degree dissertation I wrote back in 1999, and kindly agreed to republish it under a Creative Commons ShareAlike license. Given its age and its focus on the English game, he has customised the text to make it more appropriate to the site, though you can read my original text here. I enjoyed writing this, and remember the hundreds of club fanzines that I used in my research scattered about my flat. I located the football fanzine within the self-publishing movement, noting its historical affinity with the punk DIY style and ethos, and its relationship with the official matchday programme and a mainstream press and media increasingly infatuated with the elite of the Premiere League. I surveyed the role of the fanzine in a professional sport that had, within the decade, undergone a radical reorganisation at the top level, fuelled by satellite TV money, and seen an ‘embourgeoisement’ of the supporter community, characterised by a ‘new laddism’ fandom culture. The fanzines at the time responded by adopting a semi-ironic role in fetishising the working class terrace culture of the 70’s and 80’s whilst attempting to give a voice to an increasingly marginalised traditional support base. Even at the time of writing, it seemed a ‘golden age’ of football fanzines had already passed, and whilst some traditional printed fanzines continue today, much of what they represented has transferred online, and onto blogs and supporters’ forums. That said, I think fanzines have played an important role in recording the shifting social and cultural identity of football in the UK, and the web can provide an important archival platform. What are the most useful criteria for categorising social media? What characteristics help define or distinguish specific tools or platforms? What, for example, is most typical or unique about a blog? The reverse chronological ordering of posts? The ability to comment? Or something more related to its social or cultural significance? In other words, what is it that essentially determines the ‘blogness’ of a blog? But then, how does a WordPress blog differ from a Blogger blog? How do we distinguish a blog from a tumblog or a microblog? If it quacks like a duck, then it probably is a duck. But the delineations between social media are increasingly blurry. This is partly down to the mixed and often interchangeable ontological approaches we take in defining social media – by platform, brand, modality, community etc. In addition, within these often reside multiple components or features that may be common to several social media. Therefore, we might choose to define or categorise social media by how and why we are using them. Some in the educational technology field have adopted the idea of affordances within user-centred design paradigms in an attempt to correlate specific tools and features with specific purposes and activities. But as Martin Oliver (2005) suggests, interpretations of Gibson’s original notion of affordance have been problematic (and often uncritical), describing one attempt as a “conglomeration of claims about perceptions, actions and characteristics” (p.409). Crucially, adapting a holistic approach in this way supports attempts at framing the categorisation of social media within dynamic and contextualised sociocultural practices. Recalling Latour’s notion of ‘assemblages,’ we can think of any digital artefact (such as this blog post) as incorporating a history of multiple sociotechnical and cultural arrangements, processes and influences. In choosing to use Activity Theory in my analysis, I attempted to unpick these by constructing multiple and interconnected activity systems oriented towards key doctoral practices. In time, I became aware of my participants’ conscious and purposeful refinement of what could be seen as emerging social media genres, and with it, their awareness of the representational and performative roles they play – akin to what Berkenkotter and Huckin (1995) describe as ‘genre knowledge.’ However, I found that these genres were challenging existing conventions of genre definition. For example, I found the notion of blogging as a specific genre of writing (or if you prefer, the blog post as a specific genre of text) ineffective in addressing the nuances of my participants’ blogging practices. Multiple and distinct forms of writing styles, formats and motivations were emerging, often in context with other, non-blogging texts, and occasionally transcending multiple platforms. I for one, have advocated single-author academic blogs as personal spaces for freedom of expression and experimentation. Compare for example, the length, format, modality and style of this blog post with this one. Further, whilst blogging in particular is still dominated by text, social media generally are becoming increasingly multimodal and multipurpose, and as such, increasingly disruptive in terms of genre definition. (Read the account of one of my participant’s ‘scrapbook’ style blogging in my last post.) As Clay Spinuzzi suggests, social media genres are becoming increasingly multiple and complex in relation to frequency, context, social interactions and audiences. This would suggest that in any analysis of this kind, we are looking at multiple and hard-to-define, interrelated and potentially conflicting sets of genres. Why, one might ask, is this at all important beyond these predominantly theoretical and analytical concerns? Partly I think, because the way social media genres are defined and socially constructed influences our perceptions of how we use (or ought to use) these digital tools and platforms in various contexts, which within academic environments often become manifest in the form of best practices, which, as I have discussed previously, are themselves culturally loaded. This social construction often draws from popular discourses on the transformative, radical and disruptive potential of social media, in which seemingly new technological trends often represent a cultural (re)branding of established practices. These can become powerful cultural artefacts in the marketing of technological development within educational and research contexts, as is evident in the institutional leveraging of social media towards impact and outreach agendas, and in the commercial redefining of MOOCs. Academics have generally used genres to reinforce the values and belief systems of the (inter-)disciplinary cultures in which they participate. For doctoral students, increased familiarity and engagement with established academic genres is seen as a crucial part of their learning trajectory and socialisation within the scholarly community. The emergent genres that are thrown up by participating in social media can challenge, augment and subvert these established genres and their role in reifying academic practice. In negotiating these new spaces of contestation, genre knowledge – or as I see it, the ability to recognise and contribute to the social construction of these genres – becomes an increasingly important digital literacy. Berkenkotter, C., & Huckin, T. N. (1993). Rethinking genre from a sociocultural perspective. Written Communication, 10(4), 475-509. Berkenkotter, C., & Huckin, T. N. (1995). Genre knowledge in disciplinary communication: cognition/culture/power. Hillsdale, NJ: Lawrence Erlbaum Associates. Oliver, M. (2005). The problem with affordance. E-Learning, 2(4), 402-413. Spinuzzi, C., & Zachry, M. (2000). Genre ecologies: An open-system approach to understanding and constructing documentation. ACM Journal of Computer Documentation, 24(3), 169-181. Curation – new social media workflow or another web 2.0 buzzword? I’ve been asked to present various aspects of how I use social media at a number of academic events and training sessions recently. I’ve always been reluctant to over-emphasise my own social media practice in my workshops for reasons I’ve explained previously, but I welcome any opportunities for shared practice when it allows for multiple and diverse perspectives. If I have to nail it down, there are only four platforms I would really call essential. This blog and my Twitter account are those most known to external audiences. I use a desktop-based RSS reader, Vienna (Mac OS X only) to aggregate feeds from approximately 200 blogs (listed here in my blogroll) and various additional websites, and for many years I have used social bookmarking for collating and managing web resources (I switched from Delicious to Pinboard in response to the much-publicised ownership and design changes, though keep both sites active). Many academics are rightly concerned with how time-consuming social media might be. Therefore, I’ve found it useful to conceptualise how I engage with these key platforms through varying schedules within an informal workflow of key interrelated academic activities. In developing this, I’m reminded how I have so far chosen not to routinely use any of an increasing number of emergent social media such as Pinterest, Scoop.it and Bundlr (beyond the usual playing around with them). These and other sites represent a diverse range of ostensibly visual platforms that have been loosely referred to as ‘curation’ tools. One can see how they might fit conceptually in such workflows, but do they offer us anything original? How does one attempt to contextualise the potential of these sites within established social media practices beyond that of a reified set of new tools or just another web 2.0 buzzword? These social media offer the potential to extend the type of time-efficiency processes of sourcing and collating content described above by incorporating enhanced social and performative affordances. In doing so, they introduce new opportunities for educators and researchers to organise and themetize resources, synthesise key concepts and narratives, and develop personal and collaborative digital ethnographies and datasets. Here’s another angle. One of the participants in my PhD research (let’s call him Jack) pre-empted the emergence of these media in his explorative blogging activities. An interdisciplinary PhD student with an Arts-practice and teaching background, Jack began developing a ‘scrapbook’ style blog (using Posterous) with numerous and frequent posts comprising short notes and ‘jottings’, digital photos, short videos, and visual scans of sketches and mindmaps. He then began tagging these posts and reassembling them thematically through some quite extensive experimenting with third-party gallery themes and the digital note-taking site Evernote. Jack had originally developed these activities ‘offline’ using paper, pens and clippings, and the shift to a digital space enabled him to develop a more sustained and reproducible platform for documenting the process. The widespread emergence of the aforementioned curation tools coincided with the tail end of Jack’s participation in my research, and I left him contemplating their potential usefulness. He has recently launched a new Pinterest site – no doubt partly hastened by the imminent shutting down of Posterous – where he is currently exploring similar creative processes. There is no doubt that Jack’s prior explorative work represents a far more nuanced, purposeful and practice-led approach to his current activities with Pinterest than can be claimed by most users. How many of us adopt specific social media without prior recognition of a need? Often it seems, they provide solutions to problems we didn’t realise we had. At least in Jack’s case, Pinterest provides a ‘ready-made’ approximation (of sorts) to a process he had previously attempted to resolve in his Posterous/Endnote work-arounds, and there is a lot to be admired in that personal trajectory. There is now perhaps the danger that in the transference of this activity to Pinterest, it may represent a form of reification, which, as Wenger (1998) suggests, can ‘ossify’ the creative and productive process. My continued reliance on feed reading and bookmarking web resources seems positively ‘old school’ in comparison, but I believe these are reliable and effective methods which I have been able to integrate and refine within reasonably efficient everyday activities. I’m yet to be convinced how the current crop of curation tools can add value to what I personally want to do right now, but I remain open to future developments. Wenger, E. (1998). Communities of practice: Learning, meaning and identity, Cambridge: Cambridge University Press. I’m just back from visiting the NUI Galway at the invitation of Kelly Coate, where I participated in a workshop for PhD researchers from the College of Arts, Social Sciences, and Celtic Studies (CASSCS) interested in developing and contributing to the ThesisTalk blog. You can read more about the project here. It was a friendly and enthusiastic group, and to be honest they had already begun to collectively process many of the key issues and ideas that I raised. Hopefully – if nothing else – I helped articulate these and contributed to formalising them into action points to develop the blog. For me, the project as a student-led initiative is as exciting as its social media context, and the mix of enthusiasm and critical thought in evidence during the workshop should ensure the blog will evolve into a dynamic interdisciplinary and collaborative space, that will also be of interest to the wider doctoral community. Some of the discussion focussed on particular needs within the group, such as how best to facilitate the specific cultural concerns associated with developing a bilingual blog. But I think many of the issues that emerged are characteristic of group blogs generally – particularly in balancing the needs for diversity and individual subjectivities within a coherent site-wide agenda and identity. As part of my visit, I also had the opportunity to present my PhD research at the Centre for Excellence in Learning and Teaching (CELT). It seemed to be well received and generated some interesting and useful discussion around academic practice, social media and research methodologies. It was a nice opportunity to make some new acquaintances and see again some familiar faces.